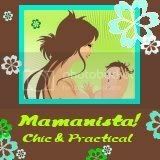 If you enjoy Mamanista!, shop for your mama needs and desires at our favorite stores! And don't forget to check out our hip product reviews, enter our irresistible contests, and use our fabulous coupons. ** These toy stores specialize in lead-free European or U.S.-manufactured toys. Not all toys in these stores are European or U.S.-manufactured, but these stores carry unique and hard-to-find items and make an extra effort to inform their customers about the origins and safety of their toys.